Written by leading experts in the field and designed for dermatologists and residents, this book includes evidence-based medicine that underscores the clinical data, as well as practical tips on how to use both biologic and systemic agents in the field of dermatology. In the past decade, there have been several groundbreaking advances in medical dermatology. Novel biologic and systemic agents hav… e been developed to treat inflammatory disorders, including psoriasis and atopic dermatitis, as well as skin malignancies such as melanoma. Biologic and Systemic Agents in Dermatology encompasses these developments by describing the mechanism of action of these various agents and the clinical efficacy and safety to treating these respective disorders. 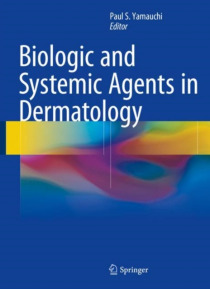 The utilization of biologic and systemic agents in other dermatologic conditions, pharmacoeconomics, pharmacovigilance, and clinical trials outcomes are discussed as well as topics including tumor necrosis, conventional systemic agents for psoriatic disease, and oral agents for atopic dermatitis.